Unlike animal growth, which is measured both in the size and number of individuals, microbial growth is all about the population size. Only the number of cells matters when calculating the size of the population. Because cells are usually grown in solution the level of growth is referred to as culture density or concentration of microbial cells. 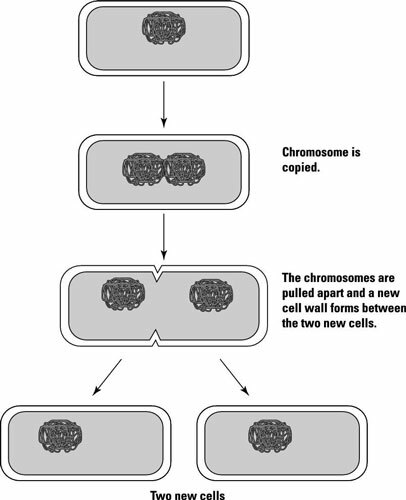 Binary fission, which is used by many bacteria, is a process in which the growing cell first replicates its DNA and then the cell wall constricts, dividing the cell into two. Some bacteria and fungi, like yeast, form new cells through budding. This is where an area on the cell’s surface starts to grow outward and is eventually pinched off when big enough. Filamentous bacteria and fungi form long chains that don’t completely separate. To make new colonies, they form a special structure called a conidiospore, which then separates, or a part of the chain will simply break off. Lag phase: The lag phase is where the cells are metabolizing but not increasing in numbers. Log phase: The log phase is when the greatest increase in cell numbers occurs. As the number of cycles increases, the number of cells jumps drastically, making it hard to visualize the growth rate. For this reason, cell numbers are converted to a logarithmic value with a base of 10, expressed as log10. Stationary phase: In stationary phase, the culture doesn’t really divide anymore. This happens because the nutrients have been used up or the pH has decreased due to waste products or the oxygen has been used up. 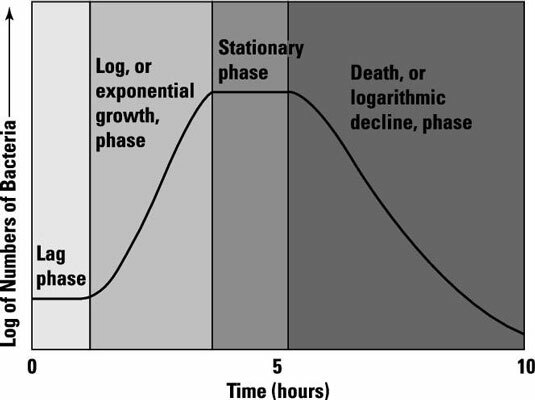 Death phase: In death phase, the cells begin to die. As their numbers decrease, the growth curve declines. The growth curve for a particular microorganism is always the same when grown under the same conditions. This is helpful when studying the metabolic characteristics of a microbe or estimating how long it will take it to grow up to a certain number of cells. If a microbial culture is given infinite nutrients and the waste products of its metabolism are taken away, then much higher cell densities are possible. This technique is often used in industry in a process called continuous culture.